Hi, I'd like to show you this page I found on Furniture Superstore - NM's website. We match our local competitor's prices. Click here to learn more. 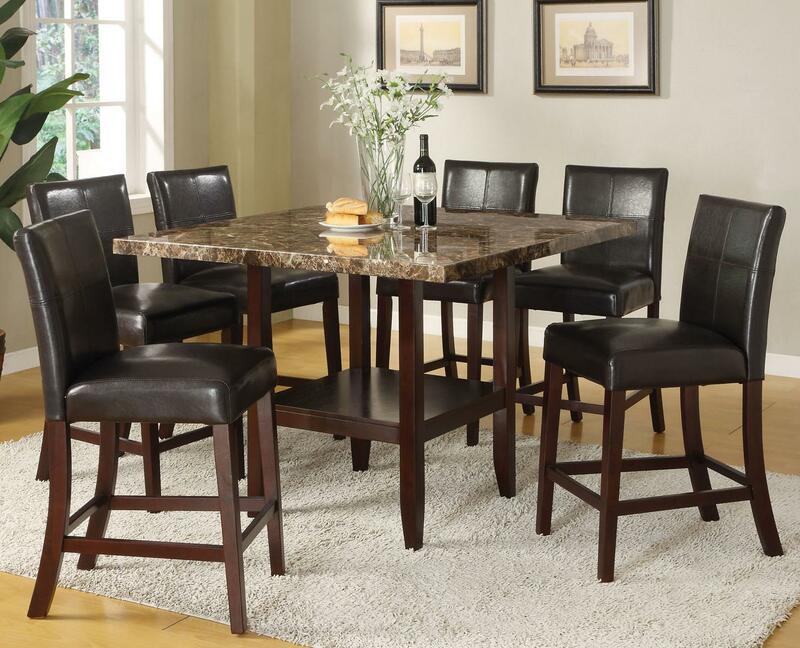 Make the most of a smaller dining space with this seven piece counter height dining set. The earthy tones of the espresso finish and tangled marble veneer top on the table create a calming atmosphere, while the sleek lines of the pedestal legs and top exude an urban refinement. A single shelf in the pedestal provides room to store plates, bowls, or other items that would typically clutter your dining table. Set your dining area apart from the norm with the six included counter height side chairs. 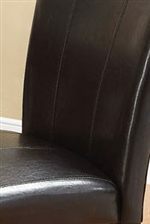 The parsons style chair features a leather-like upholstered back and seat, ensuring a sleek and polished look reflected by the streamlined tapered legs. Stretchers connect the legs, providing a spot to rest your feet while you experience elevated dining perfect for a smaller dining room or bar area. Transform your dining room with the clean styling and rich tones of the faux marble counter height pedestal table and counter height parsons chairs. 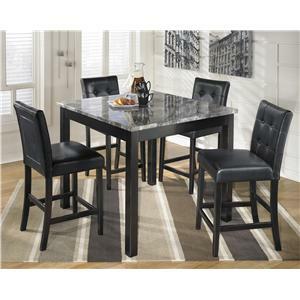 The Idris 7 Piece Counter Height Dining Set with Square Pedestal Table by Acme Furniture at Furniture Superstore - NM in the Albuquerque, Los Ranchos De Albuquerque, Rio Rancho, Santa Fe, Corrales, NM area. Product availability may vary. Contact us for the most current availability on this product. Finish & Paint Options Collection features an espresso finish with tangled marble veneer tops. Case Detail Tapered legs seen throughout collection. Description: Top Tangled marble veneer table tops. Created with your home in mind, the Idris dining collection has contemporary options perfect for a smaller loft-size home, a formal dining area, or a basement bar space. 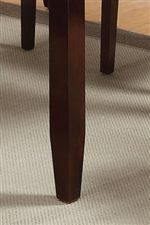 Tangled marble veneer tops decorate each table, which feature tapered legs in an espresso finish that adds depth to the luxurious tabletops. Each chair and bench is outfitted with a black leather-like upholstery that calls to mind the modern parsons chair, giving your dining area a distinctly contemporary appearance. Counter height chairs, benches, and tables allow you to take advantage of a smaller space, creating intriguing levels in your home for a look that exudes modern sophistication, while discretely creating a more open dining room. Rich, layered earthy tones balance out harsh, straight lines for a look that is both warm and sleek, the perfect combination for your contemporary dining room. The Idris collection is a great option if you are looking for Contemporary furniture in the Albuquerque, Los Ranchos De Albuquerque, Rio Rancho, Santa Fe, Corrales, NM area. Browse other items in the Idris collection from Furniture Superstore - NM in the Albuquerque, Los Ranchos De Albuquerque, Rio Rancho, Santa Fe, Corrales, NM area. Furniture Superstore - NM features a great selection of living room, bedroom, dining room, home office, entertainment, accent, furniture, and mattresses, and can help you with your home design and decorating. View recent additions to our online furniture gallery. Furniture Superstore - NM offers great quality furniture, at a low price to the Albuquerque, Los Ranchos De Albuquerque, Rio Rancho, Santa Fe, Edgewood, Moriarty, Los Lunas, Bernalillo, South Valley, Gallup, Grants, Los Alamos, Socorro, Santa Rosa, Cuba, Sanda Park, Tejeras, Las Vegas, Corrales, New Mexico area.